Fennel, the herb, has been used for thousands of years as a natural remedy, most commonly for digestive problems. It can be used to soothe bronchial coughs in the same way that dill can. It has estrogenic properties to stimulate milk flow in nursing mothers. Florence fennel or finocchio is grown for its bulb and is considered a vegetable. It goes well in fish soups and stews or tastes great raw in crunchy salads and slaws. Florence fennel is allelopathic to other plants which means it gives off a chemical that inhibits the growth of neighbouring vegetables. We recommend giving the crop a buffer zone of flowers on either side – low-growing varieties though so they don’t shade the plants. Florence Fennel should be grown in full sun, in fertile, well-drained soil rich in organic matter. It needs a deep soil as the root goes as deep as the plant is high, so it’s not a vegetable that can be grown in pots or shallow beds. are members of the parsley family. Florence fennel is a cool-weather perennial grown as an annual. Seeds germinate best when temperatures are around 15°C. Fennel will tolerate heat and cold but does best when it comes to maturity in cool weather. Fennel requires 3-4 months of frost-free days to reach harvest. For an autumn crop sow fennel in mid- to late-summer. Sow fennel seed half a centimetre deep 10-15 cms apart. Thin successful seedlings to 30 cms apart. Keep fennel on the dry side; the soil should be evenly moist but not wet. Mulch to retain soil moisture in warm regions. Companion plants are mint and members of the mint family. When the bulbous base grows to the size of an egg, blanch the lower stems. Do this by mulching up around the bulb. The bulb will be more tender and sweet at harvest. Feed with a high potassium fertiliser like Natures Organic Fertiliser every two to three weeks once established. The most common problem is slugs and snails. There are many ways to control slugs and snails, including beer traps, sawdust or eggshell barriers and copper tape. The bulb is mature when it measures around 7-10 cms in diameter. The plants, if left to go to seed, attract beneficial insects and you can gather the seeds and dry them for cooking. Florence fennel is high in vitamin C, and is also a good source of calcium, fibre and potassium. Put the egg, egg yolk, lemon juice, mustard and garlic in blender and process until well combined. With the motor running, slowly drizzle in the combined oils to make a thick mayo. Season well. Julienne the apple and toss with the lemon juice in a bowl. 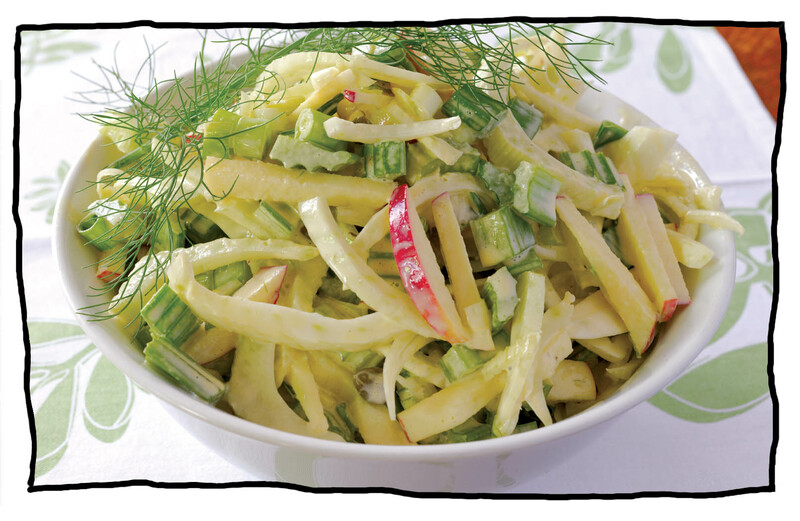 Slice the fennel, celery and spring onions thinly and add to apple along with the capers. Add the mayonnaise – about half is enough (this is a lovely mayo that can be used for other salads). Decorate with some of the fennel fronds. « Fennel shouldn’t be planted in the same area as dill or coriander, because they will cross-pollinate easily.